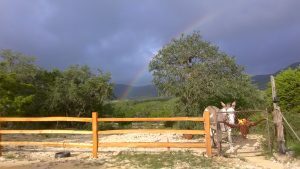 My new cedar fence of which I am extremely proud, plus Billy the donkey plus rainbow. Just finished the second coat of sealer on it. It’s cedar. We’ve had twenty inches of rain in the last week and a half and the whole earth of south Texas has responded with grass, flowers, greenness unlimited. Amazing. Working away on Simon the Fiddler. Dithered over a certain sentence; when Simon and a group of both surrendered Confederates and Union soldiers of the regimental bands get together to form a scratch band, I wrote ; “And so they precipitated out of the military structure and once again became servants of music instead of the state”, I thought maybe the last phrase should be “servants of war” but then it broke up the rhythm of the sentence. The phrase needed a two-syllable ending with the stress on the last syllable. So I kept “the state”. I know this is nitpicking but I love nitpicking. My granddaughter Faith is a lawyer with a big law firm in Austin and the head of said firm asked her if she could get me to come to Austin for a dinner. Apparently everybody in the firm and their spouses loved News of the World and they wanted to have a dinner and book-signing for me. Amazing. So I am off for Austin today and I also get to spend time with Faith and her new husband Alan. Auriel will take care of the beasties, meaning Mama Sooty Cat and her rambunctious teenage son DT, Grumpy Grady and Girl Dog. Buck and the donkey will hardly come up out of the pasture even for their morning feed, not with all that new green grass all over the meadows down there. Friend Nancy Rinn got thrown from her horse Rolf, who is a madman, and apparently broke her femur. That is quite serious. She does dressage and hunter-jumper and Rolf is bright, gorgeous, and untrustworthy. I will hear more later but still have hope it’s not broken, that’s a hell of a bone to break. Bad news indeed. This entry was posted in News on September 28, 2018 by admin.